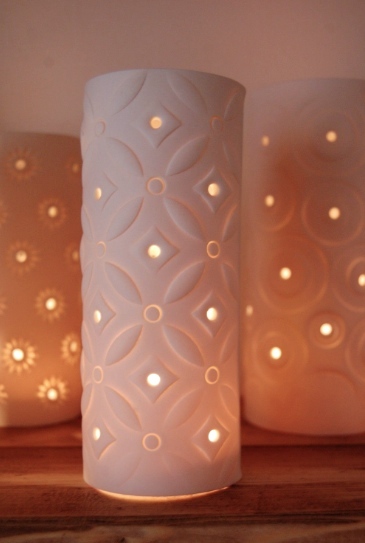 Meryl specialises in handmade porcelain ceramic lighting with decorative textured surfaces; pierced to project delicate patterned light on surface surroundings. She studied for a degree in Three Dimensional Design in 1990 at Loughborough College of Art & Design and graduated in 1993 with First Class Honours. As well as having gained experience as a ceramics teacher and a lecturer she has had many exhibitions of her work including Stoke Open, The Potteries Museum, Staffordshire, Ceramic Contemporaries, V&A Museum, London, and New Designers, The Design Centre, London. She has also been commissioned by Po Na Na - Café, London and Creation nightclub in Bristol and has won several awards for her work, including the BT Newcomers Innovation Award and the Development Award, East Midlands Art.